It was a surprise and it brought a mixed reaction. Some say it's a feat and others says it was a mistake.Whether you love it or hate it, Jinkee Pacquiao will be on the cover of Preview Magazine for its January - February 2010 issue. 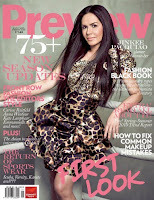 On the cover, Jinkee's wearing creations by Chris Diaz dress (worn as a top) and a skirt by Jerome Salaya Ang. What's your take on the cover? Let us know.